Asheville Regional Airport officially celebrated the opening of its new 5-story parking garage on Wednesday, March 14 at 10am. The Asheville and Henderson County Chambers of Commerce joined airport officials, the project consultants and contractors, airport staff and members of the community to commemorate this historic milestone in our region's airport's growth. "Utilization of our region's airport has exceeded projections four years in a row, and the need for additional parking had to be prioritized sooner than our master plan indicated," said Lew Bleiweis, A.A.E., AVL Executive Director. "We are proud of the end result, and pleased to now offer ample parking for our customers that is convenient, covered and an easy walk to the terminal." The parking garage offers 1,100 public parking spaces, and several hundred spaces on the lowest level designated as the rental car ready return lot. The garage augments 700 long-term surface lot spaces, and approximately 100 short-term surface lot spaces. The $22 million parking garage project took one year to complete, and has a unique architectural appearance featuring 3-story metal perforated walls that depict almost photographic images of the Blue Ridge Mountains. One of only a handful of such structures in the United States, the metal panels that make up the imagery are also functional, allowing airflow and protection from the elements inside the garage. The primary consultant on the project was Delta Airport Consultants, with structural design by Walker Consultants, architectural design by Gresham, Smith and Partners, the contractor was local company American South General Contractors, and utilities by Vaughn & Melton, also a local firm. Asheville Regional Airport is served by five airlines: Allegiant, American, Delta, Elite and United. For more information, visit flyavl.com. 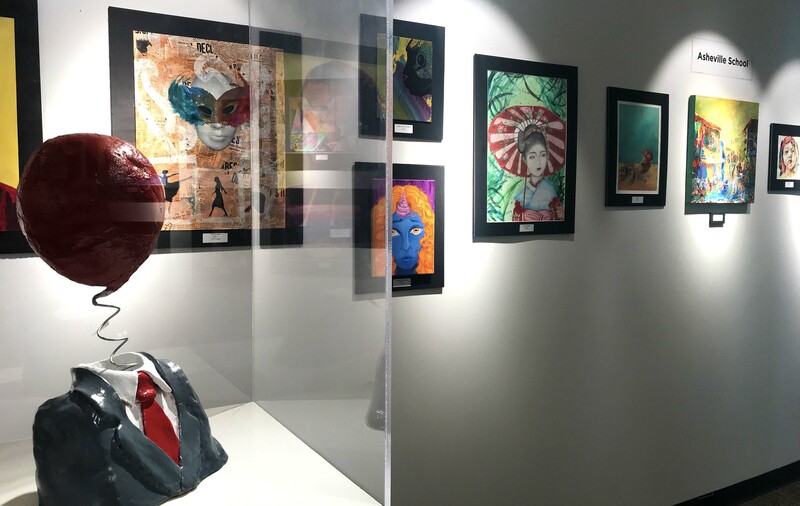 (Asheville, N.C.) The Student Artwork Showcase is now on display in the Asheville Regional Airport (AVL) Art Gallery. Ten schools from five western North Carolina counties are included in the exhibit. This showcase is a representation of our colorful region and WNC's talented students. The students' work will be on display through April 22, 2018. Many different mediums are on display, including sculpture, paintings, drawings and more, by students ranging from kindergarten to twelfth grade. The pieces were chosen and submitted by the art teachers from the participating schools. HOW DOES AN AIRPORT PLAN FOR GROWTH? We don’t control which airlines serve our airport, what routes they fly and the prices they charge for their tickets. We don’t know how many passengers will fly next month, where, or how much they will pay for their plane tickets. But – we do have planning tools. Airports use a number of tools to understand growth patterns, possibilities and forecasts. And we use tools to plan for the future. Asheville Regional Airport is in active planning now, as we continue to see significant growth in the utilization of our airport. Specifically, we are conducting what’s called a “terminal assessment study.” In essence, we need to know what changes we need to make to our physical space in order to adequately accommodate growth in the immediate and long-term future. But how do we conduct such a study? We work with qualified professionals who can assess many things, and give us quality, educated forecasts related to our needs. Specifically, we have aviation consultants who study data such as historic passenger trends, what is happening in the airline industry relating to growth, airline fleet plans, historic and projected population growth in our primary market area, and other information to forecast possible passenger growth in the short, mid- and long-term future. This information is used to assess aircraft and passenger utilization of our airport’s physical space, also in the short, mid- and long-term future. Do we have enough aircraft parking space? Is our airfield prepared for the mix of airplane fleets that will be used in the future? What about the terminal – is our gate space large enough? Do we have enough restrooms, is our security screening area large enough, and what about the utilities to support our infrastructure? These questions can also be answered by qualified engineers and other professionals. By identifying a projected forecast of growth, using available data, information and expertise, we can confidently plan for the future. And we are looking forward to the next steps in our work to ensure western North Carolina’s airport is poised and ready for continued air service expansion. The numbers are in, and Asheville Regional Airport (AVL) annual passenger numbers were at their highest ever in 2017. Specifically, 956,634 passengers used the airport in 2017, compared to 826,648 in 2016, which is a 15.7% increase. 2017 was the fourth consecutive record year of passenger utilization, and the annual numbers are more than 50% higher than they were just five years ago. "The airport has been growing during the past few years, and 2017 was especially significant," said Lew Bleiweis, A.A.E., Executive Director. "The airlines expanded their services with larger planes and more seats and frequencies to existing destinations, and a new airline and route was also added. Equally important, our region's travelers continued to use their local airport." "On behalf of the Greater Asheville Regional Airport Authority Board, I would like to thank western North Carolina travelers for flying from their local airport," said Bob Roberts, Greater Asheville Regional Airport Authority Board Chair. "When travelers make the decision to use their local airport, they contribute to the overall strength and vitality of the region at large. Much of the credit for the continued growth at AVL goes to our local communities, and we thank you." Additionally, western North Carolina's recognition and significant success as a prime tourist destination has been key to the airport's utilization and air service growth. The airport is working diligently to manage growth. On the horizon are plans to expand the Transportation Security Administration screening area from two lanes to three. The airport is also in discussion with the TSA regarding implementation of TSA Pre-check. Additionally, a new five-story parking garage is now open, which provides ample close-to-the-terminal, convenient covered parking for travelers. Last, the airport is beginning an extensive terminal assessment study to determine infrastructure and spatial needs to serve growing numbers of people now and into the future. Once the study is complete, next steps will be identified. October 2017 was the busiest month on record at AVL, topping the previous record set in July 2017. Specifically, 102,095 passengers used the airport in October, topping the previous record of 100,998 monthly passengers, and exhibiting an increase of 17.3% over the same period last year. Year-to-date, passenger numbers are up 14% compared to 2016 - setting the pace for a fourth consecutive record year. "We are busier than we have ever been," said Lew Bleiweis, A.A.E., executive director, "And we are working diligently to continue to meet the needs of our growing base of passengers. Our local travelers are finding the flight options they need, right here at their home airport. At the same time, we are welcoming many visitors to our area. The airport's growth is a reflection of the vibrancy of our great region." October's large increase in passengers was driven by a significant increase in seats offered in our market by Allegiant, American and United Airlines, and by travelers' willingness to purchase those seats and fly to and from AVL. The planes are full, and the demand for air service is outpacing the supply. Asheville and western North Carolina continue to grow as a popular destination, and the passenger numbers reflect this fact. "I would like to thank area residents for continuing to use their local airport," said Bleiweis. "Our mission is to provide an exceptional airport experience, and our airline partners' continued commitment to our region contributes to the excellent air service available here." Asheville Regional Airport is nearing the completion of Project SOAR: Significant Opportunity for Aviation and the Region - an $80 million, four-plus year project resulting in a new (replacement) runway and additional taxiway to serve the region's aviation needs for decades to come. A new 1,300-space parking garage is now partially open, and will fully open in coming weeks. AVL is served by four airlines: Allegiant, American, Delta and United. For more information, visit flyavl.com. Asheville Regional Airport (AVL) is pleased to announce that American Airlines will reinstate nonstop service to Dallas Fort Worth International Airport (DFW) this summer. Nonstop flights will be offered Saturdays, beginning June 7, and are planned to operate through August. "It is very good news for air travelers that a nonstop option will be available this summer," said Lew Bleiweis, A.A.E., Executive Director. "The Dallas area is a top destination market for our area's travelers, and the nonstop option will help make travel even more convenient and easy to and from AVL." American offered summer seasonal nonstop daily service to DFW in 2010 and 2011, and then discontinued the route at the time the airline was merging with U.S. Airways. A reinstatement of a nonstop option to DFW is an indicator of the airline's confidence in the western North Carolina market. The airport encourages travelers to book the nonstop flight, because success of the Saturday service could lead to an extension or expansion of nonstop flights to DFW in the future. And as a reminder, when not traveling on a Saturday, American does offer frequent daily connections to DFW from AVL through Charlotte Douglas International Airport, which is also a convenient and easy option. Additionally, DFW is a gateway to numerous west coast, Latin America and Asia destinations - many of which are only offered by American Airlines. To book a ticket, visit www.aa.com. Asheville Regional Airport has experienced three consecutive years of record passenger utilization, made possible by airline service and growth. AVL is one of the top-five fastest growing small hub airports in the country, offering connections to hundreds of world-wide destinations, usually with one easy connection. For more information about Asheville Regional Airport, visit flyavl.com. From local travel enthusiasts, to national and international gurus – Speaking of Travel shares stories that prove how magical travel can be. Host Marilyn Ball broadcasts each week on News Radio WWNC 570 (Sundays at noon) and 880 The Revolution (Saturdays at 1pm). You can also tune in from anywhere in the world by downloading the iHeart Radio app. Asheville Regional Airport is proud to sponsor this show because we agree that travel can be amazing. We also get the opportunity to share fun travel tips on each show. Plus, speaking of travel, we truly are western North Carolina’s gateway to and from the world! Tune in soon – and as they say on the show… no passport required!